Did you know that all the settings you make in Firefox, like your home page, saved passwords and bookmarks are all stored in a special profile folder? It’s true. Your profile folder is kept in a separate place from the Firefox program so that if something ever goes wrong with Firefox your information will still be there. It also means you can uninstall Firefox without losing your settings. Just like Firefox, other programs such as Thunderbird, SeaMonkey and Flock also store all your personal settings in a profile folder. So if you forgot the passwords saved in Firefox, Thunderbird, SeaMonkey or Flock, you can retrieve them easily from your profiles. In this tutorial we’ll show you how to recover all types of saved passwords from Firefox / Thunderbird / SeaMonkey / Flock profiles. 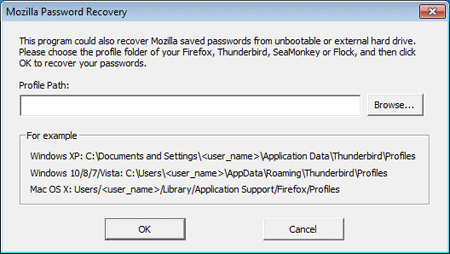 How to Recover Firefox / Thunderbird / SeaMonkey / Flock Passwords? 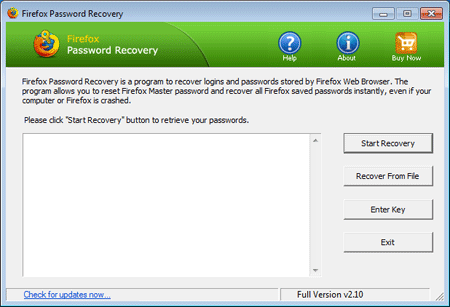 Download the setup package of Firefox Password Recovery and save it on your computer. After you’ve downloaded it, double-click on the setup file to install it. Start the Firefox Password Recovery program. Click on the “Recover From File” button. This will bring up the Mozilla Password Recovery dialog. Click on the “Browse” button to select your Firefox / Thunderbird / SeaMonkey or Flock profile. For example, the typical path of a Firefox profile is usually C:\Users\<user_name>\AppData\Roaming\Mozilla\Firefox\Profiles. While in Windows XP, it’s C:\Documents and Settings\<user_name>\Application Data\Mozilla\Firefox\Profiles. If you are still unable to locate the profile folder, just search the signons.sqlite file which resides in the profile folder of your application. Click OK. The program will decrypt and recover all your saved passwords from the selected profile.